Hello Everyone! Here's the Dev Log for Armillo: The Parallel Universe Mystery. 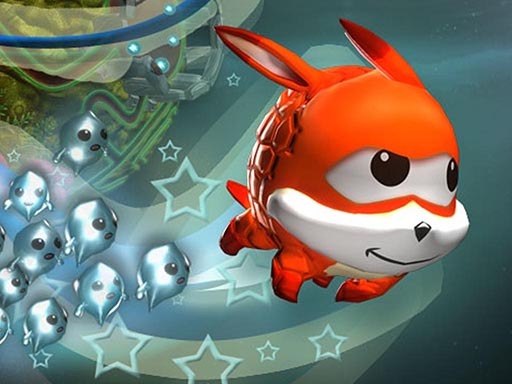 Armillo is an action puzzle platformer where you roll around a space armadillo named Armillo. He has the following primary actions: roll, jump, and boost. Lots of different game elements to get in your way. Some sections of the game even allows you to equip yourself with a gun and fire away at enemies. Each world also has its own parallel universe where you traverse between the worlds using portals. This game has been in development for over a year now, primarily worked on by three people with a bunch of people helping us out in between. It is still under development and now we want to blog/log its continued progress as we’re now at a point where we’re going to be changing things around by quite a bit, so it's a pretty exciting time for its development. You move Armillo with the arrow keys or using the left analog stick of a controller. When you equip a gun (not in the demo.. sorry ), press 'Space' or 'RT' to fire and hold to strife in the direction you are facing. Use the right analog stick of a controller to control the firing direction. Enter the parallel universe using portals littered around each world. You've got a limited time there before Armillo suffocates! Objective is to beat all the levels, fight the bosses who have taken over your universe, and be the total victor! 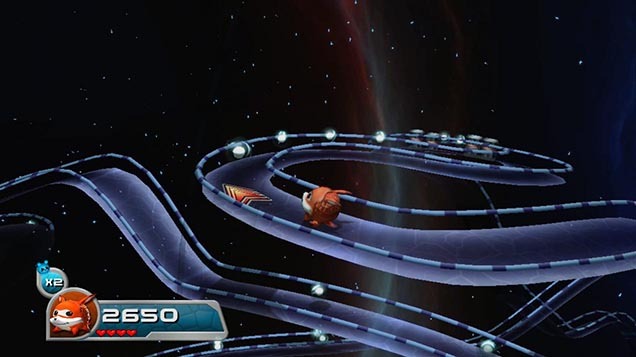 Each level is populated by orbs. 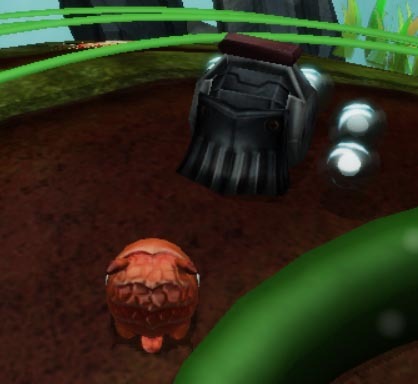 Every 5 orbs that you collect will spawn a critter (note: this is going to change). Each system has a boss stage surrounded by a force field, and you'll need to save certain number of critters in order to break through the force field to fight the boss. Feel free to ask any questions or give us any feedback. Feedback would be awesome, especially those constructive negative ones! Thanks for following! 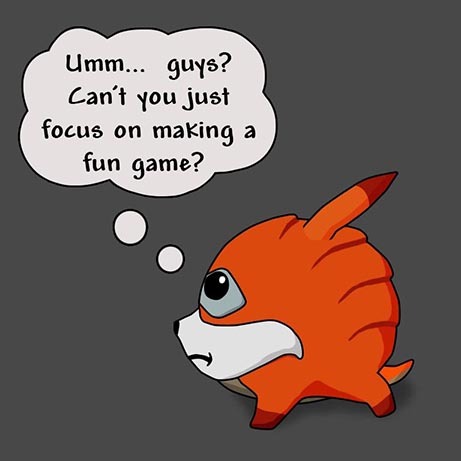 One of our challenges with development is that when we created this, it was easy for us to get biased and ignore all the little and big flaws present in our game. So at one point, we've decided to take a few months off the development of this game, just to step back and attempt to see this game from a different angle. Since then, we've come up with an uber list of what's wrong and what needs to be changed. This is where we are at now and at this point, and where we wanted to share this side of development with you guys. So we’ll look into what’s currently wrong, what are our ideas are of how to fix those issues that are wrong, and of course involve you guys in the mix with social media interaction on the development of this game. We’ll be posting up new information within the next few days including a demo of our current “We’re not happy with how this game is right now” state, that way it’ll hopefully be interesting for you guys to see this game take shape. I just want to share a bit more about our development process before we begin our development log. Hope this isn’t too boring. I have sense that you guys want to try out some demos and see some development in action. But I thought it would be nice if we share a bit of that back story before we begin all the fun stuff. Just getting all that boring stuff out of the way first. So it's been an interesting challenge for me personally as the game designer, starting with this game as a total amateur on game design, but coming from the professional industry as a programmer. It seemed cool at first to try to get as many ideas into a game as possible. Whatever the team thought was cool to add, we’d do our best to add it in. Like making it bigger, then better, and then adding more and more and more. So how do we make sure that a game is fun? By adding more enemies! By adding more mechanics! By adding more stuff. And make it bigger! But eventually you'll just learn that it's just adding more of the same, and you learn that it often doesn't work well that way, especially when your team is composed of totally different types of gamers. If not done right, adding more can often either dilute or complicate the key experiences of the game. So as you can see, this game was designed with a very amateuristic design principle - If it's cool, let's add it in. (note that I’m not discrediting this design style.. it just didn’t work for us, but I’m sure fun things can come out of it!) So in a way, we’ve found that it just drained our resources as we just kept adding more and more stuff, but finding that it wasn’t adding much to the fun. And now that I think of it, a good design strategy is to first create an amazing, engaging experience and then build around that. So instead of trying to combine a whole bunch of mechanics together and hope that it'll all produce something cool, it’s better to focus on producing something cool then build around that. 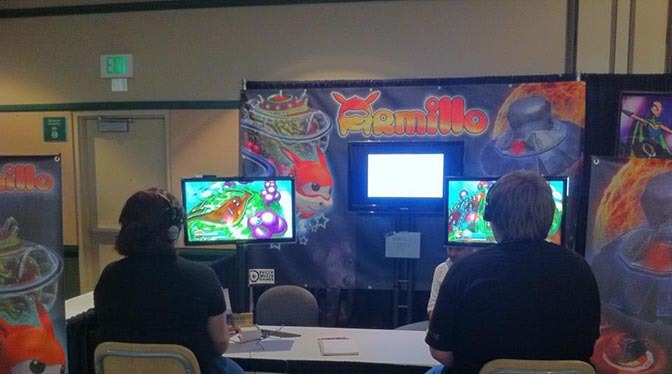 "So I sat down to play Armillo, not mentioning where I was from. I ran the game's title character around a spherical world, dashed with one button, jumped with the other. I started thinking about Sonic controls and Super Mario Galaxy level design (Sonic Adventure 2 had spherical worlds before Galaxy, some Sega fan is yelling at me now). As I played, someone else behind me said they saw some Bomberman in this game, too. The whole thing felt like a throwback, even when I—surprise—found a machine gun for my armadillo to briefly use, twin-stick-shooter-style against enemies. Plus the majority of the people who played our game demo at PAX11 signed up for future updates, and feedback was overwhelmingly positive. So we would put this game on a ‘decent’, but not on a ‘good’ level - at least in our minds. At the same time you may also feel free to call this game awful - we don’t mind - really! We might shed a tear and throw some chairs, but it’ll be fine! But just a side note that one of the challenge right now is that we don’t have a 3D artist to help us out at the moment (note that this is not a plea for help), so our initial main improvements will focus primarily on the game design/level design/audio/tech art/2d art side of things. But once we’re all set on the 3D art side, we’ll start talking about that too. Again, thanks for bearing with all this text, and hoping to have some fun interacting with you guys. Next up: We’re releasing our “The developers are not that happy with this” demo! Might take a few days for us to prepare this, but hopefully it’ll be worth it to you guys. Whoa! That's new to me. We don't have that mechanic, so it's all good! Thanks for the heads up! There's one thing that was interesting about our development - we never knew the resemblance of our game to Sonic until PAX11 where we had many people tell us about it. I traced back to our development history and found that a lot of the details (boosting, speed, and Armillo's eyes) were developed without making any reference Sonic. At one point, our 3D artist wanted to create some eyes that had a unique look to them on Armillo. He ended up creating them as they are right now, and we (noting that none of us are really Sonic fans) agreed that it looked unique. I didn't know of any resemblance until I saw a Sonic poster at PAX11 - and I was like 'uh oh..'. But we ended up doing a lot of our promo stuff using those eyes, so I didn't want to bother getting it changed. Fun stuff! We're still busy preparing the demo, and it's coming along! In the meantime, let me introduce one of the enemies. This is the blocker. Quite often he's protecting something. Whenever you go near it, it performs a nasty charge at you. You don't take any damage, but if you're not careful, he's pretty good at pushing you off into a neighboring hole. Here is the Flyer. This guy is pretty annoying as he loves to spin around you. The faster you go, the more likely he'll hit you. Just uploaded the demo to IndieDB and all we need to do is play the waiting game for it to get authorized! Gosh.. this waiting game is taking forever. How about a new screenshot? Here's Mega Armillo waiting for to squish some of those pesky Darkbots..
Once the demo is online, I'll let you guys know. Hooray! The demo is finally out! So any demo feedback should go there. Now that I've got the demo out of the way, I finally can start working on improving this game and start doing some technical write-ups on it. *whew*! So just re-posting from the feedback thread on the areas that we feel needs work. Game feels that it's aimed a bit too young. Nowadays, it seems more and more that the younger audience is often on mobile and not console/pc. First level needs to be memorable. Not there yet. Gameplay is 60% navigation & collecting. Fine for the first few levels, then starts getting boring fast. Orbs are too easy to collect. They are just there.. lying on the ground waiting for you to collect. Perhaps the harder it is for orbs to collect, the more satisfying it is. the concept of collecting orbs to form critters is really weird and forgetful. It's hard to notice it when it happens most of the time. Trying to achieve combos is frustrating, especially when the levels last quite long as it does right now and it's easy to break it. 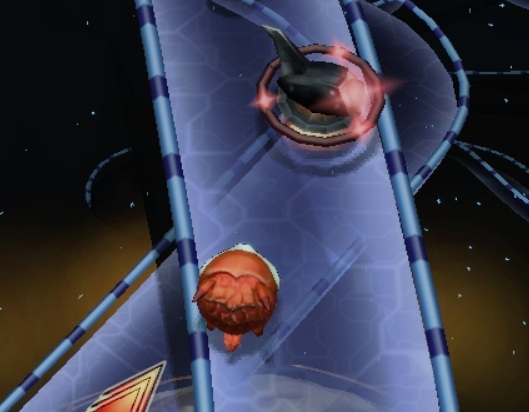 Also frustrating from a level design perspective as orb collectables must be plentiful and spaced accordingly in order to maintain that combo. Getting game over is painful. You lose your entire progress after you die. Playing the level again is also painful as you're playing a blank slate again (replay-ability issue). Bonus stages feel pointless unless you're aiming for a high score. You just go there just to get more points. Not as rewarding. Visual effects needs lots of work. Particle effects look too muddy. Story on parallel world needs to be elaborated more and made more interesting. So I'll start Dev Logging here with how I'm going to try to fix the above, in addition to any other stuff I work on for this game. Those fliers can be a huge pain! Now on to some development! So the first thing I wanted to do is to play around with the lighting a bit. Now in order to improve contrast and focus more light on the area where the player is, we could perhaps just increase diffuse and reduce ambient (overall scene lighting). It just didn't get the results that I wanted. So I figured to try out a better way, which is to replace much of the diffuse light with a point light. This is pretty simple lighting stuff, but the nice thing is that it creates a lighting scene where the edges of the sphere are darker and creates a nicer contrast in the normal-mapped world. 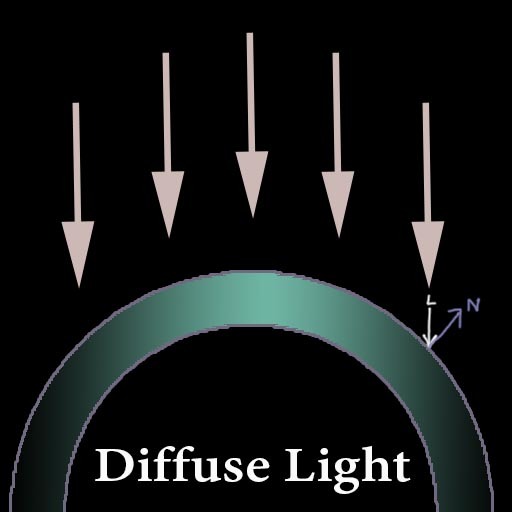 By making this change, it helps create a larger contrast through two means: One is the angle of incidence (defined by L (light) and N (normal)) which is greater the farther towards the edge of the sphere. 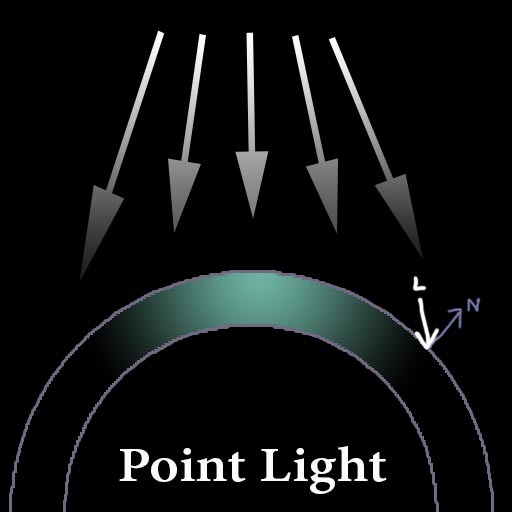 The other is light attenuation where light loses its effectiveness the farther away from the light source which is made more obvious on a sphere. The colors of the first scene was tuned a bit to get a better look, but not the second. I was able to up the contrast of the foreground while darkening towards the outside of the sphere. It also looks nice in motion as the scene is normal-mapped. So light changes as you move around the scene is more obvious now. I'm working on trying to get in a new look for the critters. Here's what I have so far. Some mixed opinions from the dev team on whether there's an improvement. Any thoughts from you guys? To give a bit more context to our readers, the critters have been lifelong friends of Armillo, they are of a similar sub-race, if you will, so they should bear some resemblance to Armillo. Keep in mind, one of Armillos's main tasks is to rescue them. If they had a voice they would sound really cartoony like chipmunks... Well sort of...maybe teenage chipmunks! regarding the lighting, one on the right looks better in the scenes you showed. Also, I hadn't seen this before, its adorable, I love it! I loved the artstyle you're going for. Can't say much about the gameplay right now, but I'll be having an eye on this nice devlog. For my first interview, I shall interview one of the critters. And there'e one right there and it looks like he's doing something! Hey there Critter! So.. what are you doing there? So.. what are you building? It must be something cool! Like you're building on top of that floating island thing with rockets. Everyone loves floating islands and rockets! So please tell me what you're making! Aww, come on! At least some sort of clue? I'll be a good boy if you show me something sort of hint at least..
Well, that's that. It looks like the critters are making something, but what could it be? - Worked on some level editing (finally!). Made some modifications such as removing barrels in a lot of places based on feedback that it ruins flow. - Slowed down those enemy Fliers by 2x, also based on feedback. That now feels a lot better! 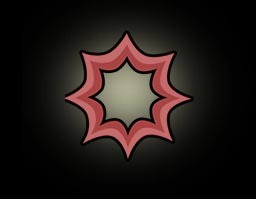 Also started to work on a new texture atlas for the particle effects. Currently a lot of the particle effect textures are procedurally generated, but it might look nicer when it's drawn instead. I'll show it to you guys soon. And got some great feedback from some of the guys on the Screenshot Saturday thread on the critters - and thanks for those who gave the feedback if you're reading this! Looks like the old critters look better, but the new critters make more sense on the context of the game (ie. critters are your friends). So I'll be keeping in the new looks! I haven't even tested this in-game yet, but I do know that once it's in game, I'll be tweaking these images like crazy to match the environments. 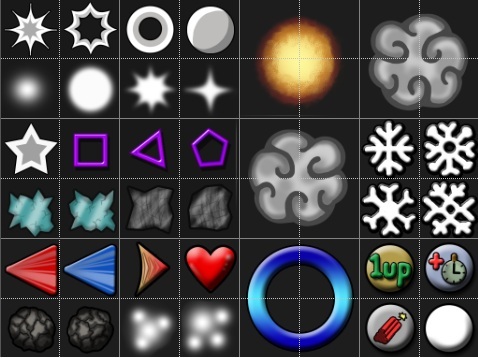 Also, if anyone wants to use any of these particles in their game, just PM me and I can provide a high-resolution alpha'd .PNG of the particles that they want to use in their game (for free & no credit necessary).